Formation of metamorphic rocks is different from from the other rock types. While sedimentary rocks form from sediments and igneous rocks form from lava or magma - metamorphic rocks form from igneous, sedimentary, or other metamorphic rocks. As the word "metamorphism" says, it is a change from one rock to another, without the first rock turning into magma or sediments in between. There is no melting, it is a solid state process. As igneous, sedimentary, or metamorphic rock is pushed deeper and deeper down to the interior of the Earth, temperatures and pressures increase. The rock is also experiencing different kind of stress which makes it foliated. These new conditions make the minerals in the rock unstable. When a mineral gets unstable, chemical reactions will happen, where a mineral turns into another, more stable mineral in the new conditions. 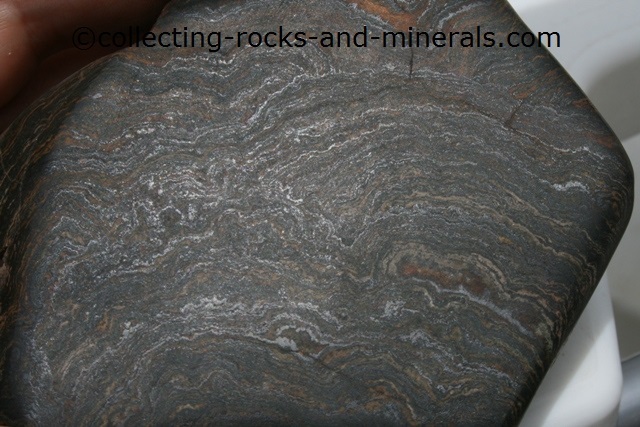 As the conditions change, gradually the minerals in the rock change, which turns the rock into a new rock. If temperatures rise to a point where the rock melts and turns into magma, igneous rock is formed. As long as the rock stays solid, this is a metamorphic process and metamorphic rock is formed.